Audio visual solutions that integrate technology and workplace design to maximise collaboration and productivity. Our clients tell us they choose AA because we improve their business. We don’t just roll out a pre-configured system – we identify which technologies will assist business performance and deliver on time and to budget. From this information our designers create a customised solution which is then mocked up in one of our purpose built pilot spaces where feedback from the clients key staff is used to modify the design so that it dovetails perfectly with the client’s needs to create a workplace that inspires collaborative, creative and productive behaviour. Our installation and project management team roll out the solution on the clients premises in conjunction with their architects, interior designers and base build contractors. A training program is developed in partnership with the clients technology champions and delivered in a structured approach to the staff to ensure that the maximum benefit is gained from the clients technology investment. Click here for our Ways-of-working-whitepaper on Workplace Technology. Our guiding principle is ‘Hear and be heard, see and be seen’. This is achieved using commercial grade High Definition and Ultra High Definition screens and HD audio products with supporting acoustic treatment. If meeting attendees, whether in a video conference, video collaboration or presentation session, can properly hear and see the content and/or remote participants, the technology can deliver on its promise of 100% productive meeting time. Spatial design and initiatives surrounding the creation of a highly productive working environment have seen organisations both local and abroad adopt digital interactivity as part of their ‘ways of working’ presentation capabilities. This technology is found in many commercial-grade screens and provides a facility to engage with the technology and the media content. It also provides a means to create and encourage collaborative, brainstorming and free-thinking sessions supported by the meeting environment. Each of these interactive screens are carefully matched with the space and its intended activity to ensure that the meeting/presentation is as productive as possible. Collaboration and productive discussion are only as good as the content provided. We have perfected a combination of equipment that not only allows for a hard-wired connectivity but also a wireless connection capability in the simplest possible way. We understand that not all organisations issue team members with a laptop which is why we encourage our clients to explore the option for a platform that will support most mobile devices via our high bandwidth wireless infrastructure. We leverage the convenience and power of current mobile technologies to provide an effortless user experience to sharing content which encourages a more relaxed, creative environment ultimately fueling productivity. One of the primary communication facilities for many organisations is the video conferencing system. 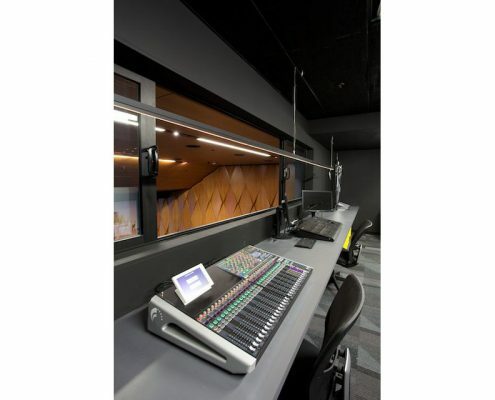 These spaces offer users the capability of both HD quality video and audio when communicating with external as well as internal groups. The quality of the HD video and audio system also allows team members to have sensitive and detailed discussions without the expense and downtime of travelling. Being a multipurpose space, the technology solution also provides an interactive capability where users can share content as part of the VC session, annotate over shared content or have the option of a digital whiteboard as part of the session. The success of any AV project depends on how well the technology is adopted by team members and how much productive time they get out of an average 60 minute meeting. During our workshops with project and team members we often discover that they are losing anything up to 15min trying to set up the AV systems in the room and perhaps another 10min in conversation with IT support, this leaves only 35min of productive meeting time. Take into account the 5min over-run of the previous meeting and latecomers, we are down to around 30 minutes of productive time. The unified system control facility for the rooms is primarily aimed at providing a platform for the user with a consistent mode of operation when setting up the presentation in preparation for the meeting. This consistency does not only extend to the way the user interfaces with the room technology but also provides a consistency in the automation of the shut-down procedure when a session ends. This ensures that the user setting up the next meeting executes the system setup in the same manner every time. This eliminates confusion and decreases wasted time on non-essential processes prior to the meeting start. The result, more productive meetings. A common theme uncovered in our workshops was the lack of suitable meeting spaces at some point through the work week. Most organisations have limited real estate for meeting rooms which leads to a shortfall for meeting participants at some times while the meeting rooms sit idle at other times. Lack of suitable space causes frustration with some teams who will often either find alternative meeting spaces that are unfit for purpose and compound the issue by engaging alternative VC and presentation technologies i.e. Skype, mobile phones etc. We also found that these teams often scrap scheduled meetings or exclude regional VC participants because of a lack of available purpose build spaces and/or technology. The good news is these difficulties are overcome simply by deploying a room booking system. The room booking system provides a means of securing the space as well as matching requirements to the AV technology in the room. It also interfaces with Outlook eliminating the need for additional systems outside of the current work-flow, minimising training and maximising adoption. This system will secure a booking, monitor time spent in the room and alert occupants when a session is due to end. This mitigates over-runs and maximises use of the companies resources. Activity based working (ABW) is based on the premise that no employee ‘owns’ or has an assigned workstation. 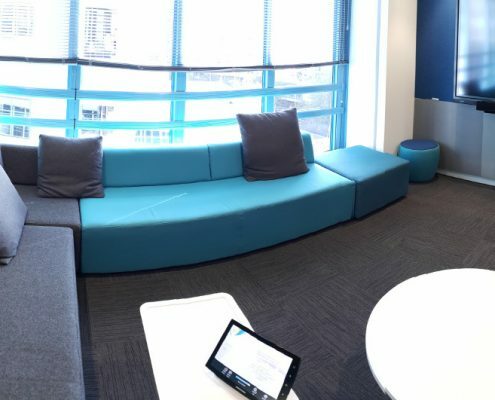 The ABW workspace provides employees with a variety of predetermined activity areas that allow them to conduct specific tasks including learning, focusing, collaborating and socialising. The key benefits are improved productivity and reduced space costs. What technology do I need for ABW? A unified communication (UC) platform like Skype for Business that allows flexibility and accommodates a mobile or non-territorial team environment. 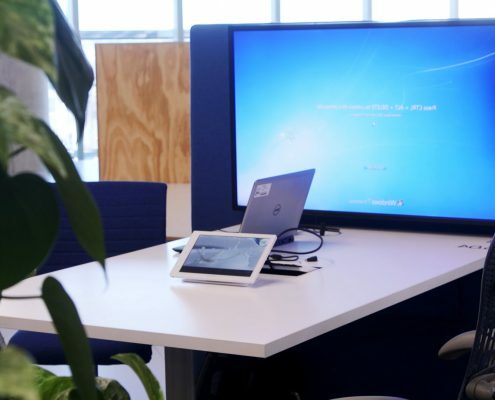 ABW environments are all about collaboration and a display system that allows you to not only integrate with the UC platform, but also enables team members to be creative and share their ideas via a large format interactive screen is an absolute must. Managing the AV enabled real estate should also be high on your priority list. 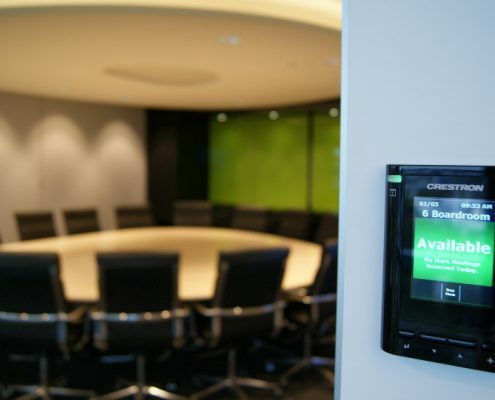 A simple to use room booking system which integrates with Outlook from the user friendly digital touch panel mounted outside the meeting room. If you are involved in the interior design of a commercial space and are looking for a company to supply technology into the project in a way that is complimentary to the overall design and aesthetics of your job then please contact us. Automation Associates has a 20 years experience working with Interior Designers and understand the process involved in delivering a simple reliable system that is discrete and enhances functionality and visual appeal. Technology projects often require input from many different vendors for example screen suppliers, software vendors, control system manufacturers. Automation Associates cover these requirements in house and give you one point of contact for design, installation and project management of technology portion of the project making your day that much easier. Contact us for more information on what we can do for you.